Meeting with Professor Raoul Tubiana and Philippe Chamagne. Conservatories : CRR de Paris , PôleSup'93, Olivet, Clamart, Lagny-sur-Marne, Montmorency etc. Ecole Normale de Musique Alfred Cortot de Paris since 2001. - Piano with Odile Delangle and Michel Wladkowski. - Flûte with Patricia Nagle. The National Orchestra of Radio France, on tour in Frankfurt, Germany with conductor Kurt Masur in March 2009. Harp Congress in Lyon, Oboe in Tours, Saxophone in Gap etc. After receiving her secondary school diploma, Coralie Cousin decided to study physiotherapy and to unite her two passions : working with artists, treating and curing musicians. - Her expertise derives from more than 20 years of experience. In 2002, creation of « The Musicians' Clinic » in the 13th district of Paris. 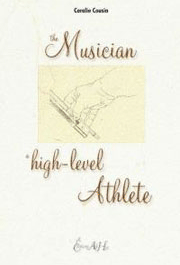 The Musicians' Clinic is an ideal place for musicians to consult and benefit from personalized treatment and retraining. Coralie Cousin has treated and guided more than 3000 musicians in styles ranging from jazz to classical etc. Her priority is pain prevention and she teaches young musicians to adopt postures and movements that will enable them to play without damaging their body. She practises reeducation, treats symptoms and offers musicians the joy of playing again to their maximum capacity without suffering. Thanks to her, numerous musicians have been able to take up their instruments again, after having been forced to stop. - The International Association of Harpists and Friends of the Harp. France Musique : « A portée de mots » with François Castang 2005. France Musique : « Présentez la facture » with Marc Dumont 2006. La Cinq : « Daily Health 2007 ».